Chiehyu Li and James Losey at the New America Foundation have completed an excellent comparison between broadband service overcharging schemes in the United States (and the slow speeds and high prices that accompany them), with broadband service in Japan, where download usage caps are unheard of, speeds reaching 1Gbps are priced at under $60 a month, and bandwidth throttling of peer to peer applications is uncommon at best. Although services offered by Japanese ISPs are more expensive than these “economy plans,” they are not only much faster but offer considerably more flexibility in terms of bandwidth consumption. In Japan, the lowest cap for residential Internet of the companies we researched is 150GB per month for upstream only, implemented by i-revo, a nationwide fiber ISP that provides up to 100Mbps symmetrical access. BB Excite, SoftBank and Internet Initiative Japan (IIJ) also imposed 420GB to 450GB bandwidth per month only on the upload side. Although pricing is higher for some of the “economy” plans in Japan, customers there have no risk of running into overlimit penalties and fees punitively placed on customers’ bills when they exceed the paltry caps usually found on Internet Overcharging “economy” tiers. With some charging $2-10 per gigabyte, it’s easy to send bills much higher with very little usage. Of course, it’s no mystery why American providers are seeking to impose various overcharging schemes on their customers — they want fatter profits, and will leverage the barely competitive broadband market to get them, especially if they think policymakers won’t respond with the appropriate oversight and regulation, where necessary, to protect consumers from monopoly/duopoly-leveraged pricing. 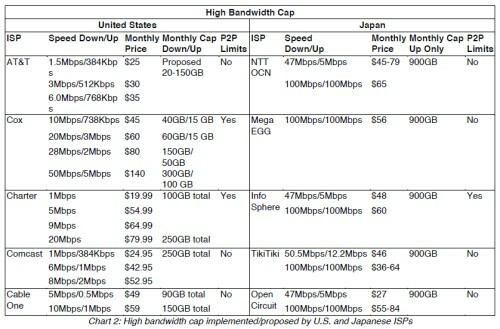 Even comparing the higher bandwidth caps in the two countries, including the highest priced residential plans, bandwidth caps in the U.S. are drastically lower and more restrictive than those in Japan. 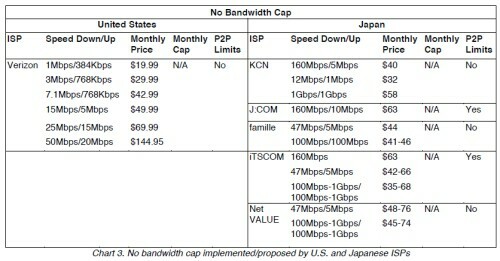 Chart 2 shows service options with the highest bandwidth cap in the two countries. U.S. ISPs such as Cox, Charter, Comcast and Cable One cap bandwidth from 20 GB to 250GB per month for combined up and downstream traffic for their higher-priced Internet services. Among these ISPs, Cox has the highest monthly caps, offering 300GB for downstream and 100GB for upstream to Ultimate Package subscribers (50Mbps/5Mbps). Comcast caps bandwidth at 250GB a month, combined upstream and downstream, for all tiered Internet services. Continuing the U.S. trend towards more restrictive Internet service, AT&T has proposed bandwidth caps of 20-150GB a month. In addition, some of these ISPs have imposed network management on users’ Internet traffic. The United States has one major multiple cable system owner that has sworn off these schemes – Cablevision. A few competitors, including Grande Communications, found in Texas, also advertise they will not impose limits or schemes on their customers. Frontier Communications has promised its customers it will not enforce any limits on its broadband customers until further notice either (although we’d prefer they eliminate the 5GB Acceptable Use language from their terms and conditions). Verizon is perhaps the most important non-capper, at least for now. It has no current plans to implement Internet Overcharging schemes on its customers. Once again, the United States is heading backwards in broadband pricing, speed, and freedom for customers to use their service as they see fit. Instead, providers with Internet Overcharging schemes seek to limit broadband usage to extract maximum potential profits, and protect their video business from online competition. The fundamental question for the future will be, who controls America’s Internet? Look at the upload speed Japan offers compared to our ISP’s. Japan’s slowest is 5Mb/sec! I could only imagine having 100/100 service. Yea, that is a pipe dream. 1Gbps symmetric, no caps for $58!!!! Who’s the leader of the free world again? No idea. 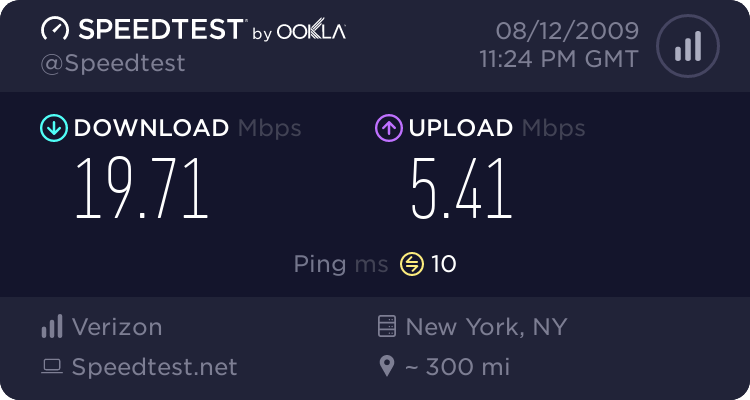 I just got off of Verizon’s FiOS in my area, and must I say, it is very nice. I was fixing up a malware infested PC that I was called in for last night. Not only did the person have a fast PC (they came to me to choose one out), the FiOS helped out big time with downloading some cleanup programs and installing updates. For me to install Vista SP2 for 64-bit on their PC, it was a 528MB file, which is a file that would take me roughly a half hour to download, or 1 and a half hours on another one of my DSL lines. The FiOS pulled down that file in basically 2 and a half minutes and, yeah. I was also watching Star Wars: Episode 6 in HD on FiOS TV and the picture quality is great as well. Yes, the latency on the line is very, very low! My DSL lines can only manage 31ms to that rest server as a minimum! FiOS makes me very jealous when I use it. Sure, FiOS may not be what Japan has, but considering the other options in the US, it’s great. And how large is Japan compared to the US and what’s the population density? We have the same arguments here in Australia about “look at Japanese internet it’s so much better” etc ignoring the fact that most Japanese live in apartment blocks rather than houses. Except when you look and see that places like NYC still can’t compete with their internet. It is MORE than that. Yes, this is an extremely important point. Providers routinely try and find an explanation (other than rampant profiteering admissions) that “explains” the disparity in speed, pricing, and growth of broadband service between the United States and parts of Asia. The population density argument does have merit — initially during construction and dealing with the capital costs to build and maintain the network. You can honestly say that it costs less to wire more populated areas on a per customer basis than a rural area. That is why cable companies still won’t provider cable TV to rural areas that lack enough homes to potentially service. However, that doesn’t mean it’s cheap to wire places like Manhattan. Indeed, Verizon is running into a lot of costly challenges wiring FiOS in the most densely populated apartment blocks they didn’t face dealing with places like Long Island, or in smaller cities. 1) The cost of living in Japan, particularly in some of the largest cities, is considerably higher while their relative costs for broadband service are dramatically less for much higher speeds. 2) In our urban areas, where incumbent providers ofren do face some overbuilders, speeds are still dramatically lower than what is available in Japan, and prices are higher (often higher than in smaller U.S. cities and communities where those same companies offer service), and Japan still beats the pants off of us. Additionally, the Republic of Korea offers comparably fast and inexpensive broadband service similar to Japan, even in areas that would resemble any medium-sized American city with suburbs. The fact is, population density and where people choose to live in only a part of the story. In this country, the lack of a firestorm of competition keeps speed growth incremental, and investors looking for no dramatic game-changers in the broadband marketplace that could potentially impact revenue. Wall Street hates price wars and heavy competition, but in a healthy competitive market they become inevitable and Wall Street thinking eventually adjusts, building in the competitive factor to expected results. One last point – most of the nation’s largest providers do not concern themselves with wiring the wide expanse from sea to shining sea in the USA. They increasingly focus only on the most profitable, urban markets and population cores and throw more rural residents to the CableOne, Suddenlink, Embarq, and Frontier’s of this country. I already addressed that point in another article on this site. As far as urban population density goes, Japan and the US are about the same. Why aren’t the figures the same for urban areas? Because we are getting screwed. I guess the US isn’t a leader in technology anymore. We get the “sky is falling” from these ISP’s here in the USA and yet here is Japan trucking along outpacing the supposed leader of the free world.